So much for a slowdown in the U.S. smartphone market. AT&T reports that they sold 6 million smartphones in the first two months of the quarter, and are selling 100,000 more every day. This puts them on pace to shatter their previous record, of 6.1 million smartphones, which they sold in Q3 of 2010. Part of those numbers can be attributed to Apple’s iPhone 4S, which went on sale in October and immediately started setting sales records. According to John Stephens, AT&T’s Senior Executive VP and CFO, the sales are also a reflection of the strength and diversity of their smartphone lineup. Stephens also touted the importance of their HSPA network with the iPhone 4S, claiming that customers recognize the advantage of the faster data rates AT&T can offer to new iPhone buyers, as well as their simultaneous voice and data services. If the torrid pace of 100K smartphones a day continues through December, AT&T will move as many as 9 million smartphones this quarter, a 50% increase over their previous record. It looks like a very merry Christmas indeed for AT&T this year. at&t ROCKS!!!! still wish they would call it cingular again though and bring back the little "jacks" icon! at least they kept the orange!! 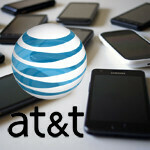 i still dont understand why people stay with ATT if they rank lowest in customer satisfaction every year. Is the iphone doing that well for them? Customer service wouldn't be a deal breaker for me with any network. I mean honestly, how often do you talk to customer service? If it's more than a couple times a year, you are doing something wrong. Simple philosophy: don't use more minutes, texts or data than you have, and you typically won't have to talk to customer service that much. For the record I've had at&t for almost 4 years now and haven't had any major issues with them. I don't own a Iphone. I still get good speeds except when I'm in a major city it gets faster. Go by what works for you, not what Consumer Reports reports. It is true on 100k smartphones on day...but they are not all new customers, obviously. The big reason for the network improvements is limited data plans, and now throttling of unlimited data customers. I get excellent service with AT&T. I also had to deal with their customer service for 4 defective Captivates I had. They kept replacing them till I got one that worked like it was supposed to... which is also why I stay away from refurbished junk. Anything I've ever called them about, they've fixed the problem asap. But coverage & prices determine which carrier I go with. I need good coverage that covers all of Long Island, NYC (Sprint/TMo do not) and it's cheaper than Verizon.